If your family inhales mac ‘n cheese the way mine does, if you don’t tell them this is made with cauliflower instead of pasta, they just might not even notice. And if they do, they probably won’t care, ‘cause it’s so darned delicious. Preheat oven to 400F. Toss cauliflower florets and chopped onion with oil and spices on a rimmed baking sheet. Roast for 15 minutes, shaking pan occasionally. While vegetables are roasting, make the sauce. Start by melting the butter in a medium saucepan placed over medium heat. Stir in the flour and cook for 2 minutes, stirring constantly. Slowly whisk in 1 1/4 cups milk to form a smooth sauce. Let cook for 3 minutes, stirring often, then whisk in cheese, cayenne and paprika. Cook, stirring often, until cheese has melted and sauce is thick. Taste and add salt and pepper to suit your preference. Transfer roasted vegetables to a casserole dish large enough to hold in a single layer. Pour hot cheese sauce over top, jostling cauliflower so it is coated on all sides with the sauce. In a small bowl, combine the panko and melted garlic butter. Sprinkle evenly over the cauliflower and sauce. 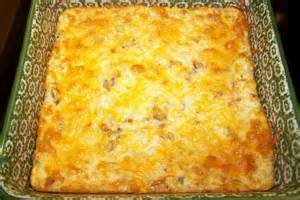 Put the casserole dish in the oven and bake until sauce bubbly and topping is golden brown, about 10 minutes. Serve hot with wedges of lemon to squeeze over top for an extra pop of flavour. Cottage cheese is a staple in many healthy eating plans. 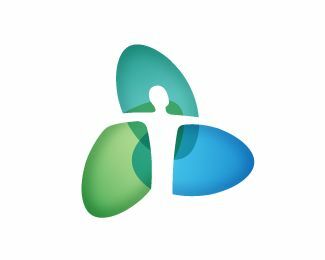 The dairy food provides benefits especially for people who are trying to lose weight or improve their health. But cottage cheese calorie count and nutrition can vary depending on the type that you buy. Many healthy eaters who include cottage cheese in their meals buy the 2 percent low-fat variety. This version provides enough fat for flavor but not as much as the regular variety. So how do the fat and calorie count compare across the different varieties of cottage cheese? Keep in mind that a single serving of this dairy product is just four ounces or a half cup. At mealtime, it is very easy to scoop much more than that onto your plate. So be sure to account for your full portion size if you are counting calories. Cottage cheese is low in sugar and an excellent source of phosphorus, calcium, riboflavin, and vitamin B12. However, the dairy food is high in sodium. So if you are trying to cut back on salt, this might not be the best choice for you. Some brands, however, make low sodium or no salt added versions of cottage cheese that contain less sodium. Many healthy eaters consume cottage cheese because of the relatively low-calorie count. Bodybuilders often choose cottage cheese as a snack or as part of a meal because it is a quick and convenient source of protein. A single serving provides over 15 grams of the muscle-building nutrient. Cottage cheese is also a low carb food. The carbohydrate count for a single serving is just over 4 grams or 16 calories from carbohydrates. If you don’t eat any toppings on your cottage cheese this food makes it easy to keep your carb count low. Lastly, cottage cheese is easy to incorporate into a meal and needs no special preparation to enjoy. For that reason, many dieters include it in their meal plans. The food is easy to carry, simple to eat if you are on-the-go, and pairs well with other healthy, diet-friendly foods like fruits and vegetables. What’s the Difference Between Large and Small Curd? When you buy cottage cheese, you can choose between different fat contents, but you can also choose from different curd sizes. Curds are the thick lumps in the food. There is no real nutritional difference between small curd or large curd (sometimes called “chunk style’) cottage cheese. The difference is simply a result of the way the cheese is made. After you buy cottage cheese, make sure to keep it refrigerated and tightly sealed. It is a perishable food so it is best to consume cottage cheese before the expiration date on the package. Shelf life can depend on how the food was manufactured. Except for dry cottage cheese (that has no liquid part), this food does not freeze well. Cottage cheese is great plain, but you can also pair it with other foods to make a complete meal. Try any of these ideas. Make a cottage cheese dessert by mixing in dark chocolate chips or cocoa nibs. Cottage cheese calories are a good source of energy and the dairy product can be a good addition to your diet, especially when you pair it with other healthy foods. Get creative and try new flavors to keep this food on your meal plan. ARE YOU KIDDING!! Just when I think cauliflower can’t get any better! Well here we go! Cut cauliflower into florets & cook in boiling water until tender about 10 minutes. Drain. Mash the cauliflower while still warm. Stir cheese, eggs, panko, cayenne & salt to taste. Coat the bottom of a griddle or skillet with olive oil over medium-high heat. 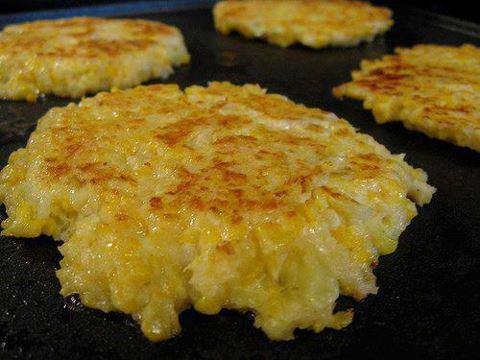 Form the cauliflower mixture into patties about 3 inches across. Cook until golden brown & set, about 3 minutes per side. Keep each batch warm in the oven while you cook the rest. Add oil to a large skillet, add spinach and cook over low heat just until wilted, about 3-5 minutes. Combine in a medium bowl ricotta cheese, cottage cheese, mozzarella cheese, and oregano. Add 1 cup marinara to the bottom of the slow cooker. 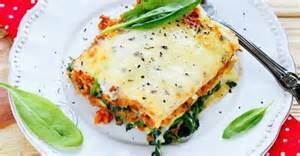 Next, add a layer of broken lasagna noodles, spread 1/4 of cheese mixture over noodles, next top with 1/4 of wilted spinach. Repeat the layers until all the ingredients are used up. I prefer to add cheese last. Cover and cook until noodles are al dente and cheese is bubbly. Cook on low-heat 4-5 hours or high heat 2-3 hours. Remove the lid and add parmesan to the top. Turn off the slow cooker and allow the casserole to sit for 15 minutes before cutting. Serve garnished with fresh basil and additional parmesan, if desired. Recommend a 6 quart slow cooker, or approximately that size. Combine almond flour, coconut, flax meal, butter, and Splenda together. Press into 9-inch pie pan or spring-form pan. Use a piece of plastic wrap to prevent sticking to your hands. Bake in oven for 8-10 minutes. Set aside to allow to cool. In a stand mixer, combine heavy cream, Splenda, and vanilla extract. Beat until soft peaks form and no liquid is in the bottom of the bowl. In your stand mixer, cream cream cheese and Splenda together on medium speed. Fold in half whipped topping, but be careful not to over-mix and lose the fluffiness of the whipped topping. Chill until nut crust is ready. On top of cooled crust, spread the cream cheese-whipped topping mixture out to the edges. Make as even as possible. 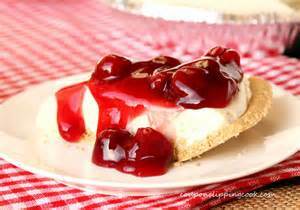 Spread sugar free cherry pie filling on top of the cream cheese mixture. Pipe the remaining whipped topping along the outside of the pie pan. I just brown the sausage, drain it. put it in the bottom of a greased casserole dish. mix all the eggs, half & half, water and cheese together. bake at 350 for 45 -60 minutes. Mixing the cheese into the eggs makes this so much better than just sprinkling it over the top. This casserole lasted us 3 days. We just sliced some and reheated in microwave when ever we wanted. It’s good at room temperature.